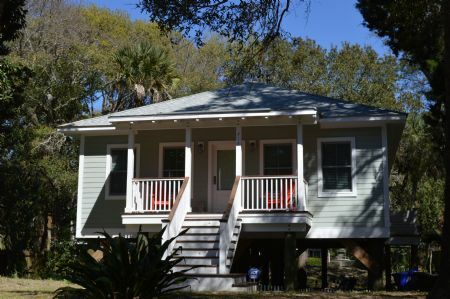 Welcome to 804 W Cooper Ave, Folly Beach! Brand new construction & new to the rental program. Luxury décor and furnishings offer that high end look, yet the beachy design lends to the perfect cozy feel and beach house balance. Follow the sounds of the waves you will hear from the porches to the public beach access that is just a short, 2-minute walk away. With 5 lovely, huge bedrooms to spread out in, 3 full bathrooms, and 2 half bathrooms to accommodate up to 11 guests, you will all feel right at home. The open concept on the first floor allows everyone to relax in the living room, cook in the kitchen, and eat or play games at the dining table without being apart. 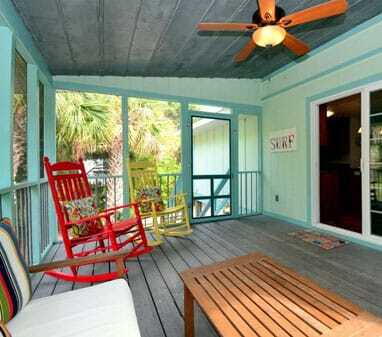 Beautiful hardwood floors throughout accent the beachy furniture and the white kitchen with granite counter tops. Kitchen is fully stocked with everything you will need to cook the big family meals and all stainless steel appliances, including an over-size refrigerator and gas range. Pop open a bottle of wine you chilled in the wine cooler and gather in good conversation with 4 extra bar stools around the wide counter between the kitchen and dining area, which is also ample space to display dishes to serve buffet style. Dine together at the long, 10-person table. Living room has 2 comfortable couches, 2 oversize arm chairs, and a large flat-screen TV for relaxation after a long day at the beach. The half bath is conveniently located off the living area, along with the laundry room down the hall. Step out onto the screened in porch, accessible from the living and dining areas, for alternate dining and gathering space at the 6-8 person table and patio furniture. Screen porch leads out to the open deck to catch some sun on the 2 lounge chairs. 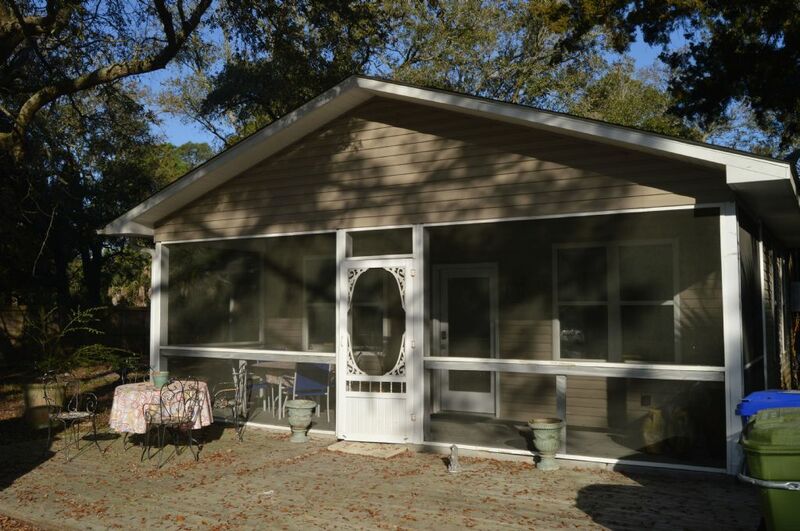 The sounds of the ocean waves nearby can be heard from all porches while overlooking lush Lowcountry wooded areas. 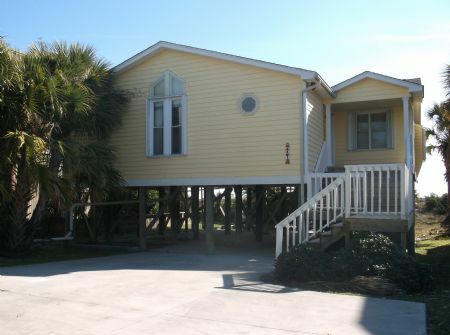 The beach access at the corner of East Ashley Ave & 8th St. W. is only a few minute walk from the full length front porch of the house. Bedrooms start on the first floor with the impressive master suite. Master includes King size bed, large flat screen TV, and a door leading outside to access the open deck. Attached master bathroom is truly a sight with sliding doors that open up to an extended double sink counter, teal soaking tub, large walk-in glass shower, and massive walk-in closet with antique sliding barn doors that is everyone’s dream…man or woman! Head upstairs to the 2nd Floor with the 2nd half bath off of the hall, additional 4 bedrooms, and 2 full bathrooms. Bedroom 2 has a King bed, large closet, and shares a jack-n-jill bathroom with bedroom 3, which has 1 Queen bed. The 4th bedroom is a 2nd master suite with 1 King bed, flat screen TV, and nearly identical large bathroom (minus tub) and walk-in closet as in the downstairs master bedroom. Bedroom 5 is found behind the large sliding doors off the hall with 1 Twin daybed and 1 set of Twin Bunk beds. The home owners have spared no expense in updating all bathrooms with white cabinets, granite countertops, and high end fixtures. Explore the house and take note of all the little details that make each room unique, such as the antique sliding doors, various headboards and night stands, and intricate door handles. Easily fit 4 vehicles in the 2-car garage. Extra parking for an additional 2 vehicles can be parked in the gravel driveway. Move the charcoal grill out from under the house to the grassy or gravel area to grill out for the family. The outdoor shower is also found in the garage area and there are 2 hoses, one on each porch, for washing off the sand after spending the day at the beach. The unique, downtown area of Folly Beach is about 1 mile away to all beach shops, farmers market (select day of week), live music, and try one of our many local restaurants. Restaurants here offer everything from low country seafood to pizza to oceanfront, higher end dining. Downtown Charleston is also only a 20-25 minute drive, which offers world-class dining, historical tours, museums, boutiques, harbor walks along the water, the aquarium, and much more for added entertainment. Amenities include Wi-Fi, cable TV, washer dryer, fully stocked kitchen with modern, stainless steel appliances, central heat and air conditioning, 24-hour emergency on-call staff. Home is non-smoking and non pet-friendly. No events allowed that exceed the maximum occupancy of the home. Must be 25 years old or older to rent. We hope to see you soon on Folly Beach! Thank you for choosing Carolina One Vacation Rentals!